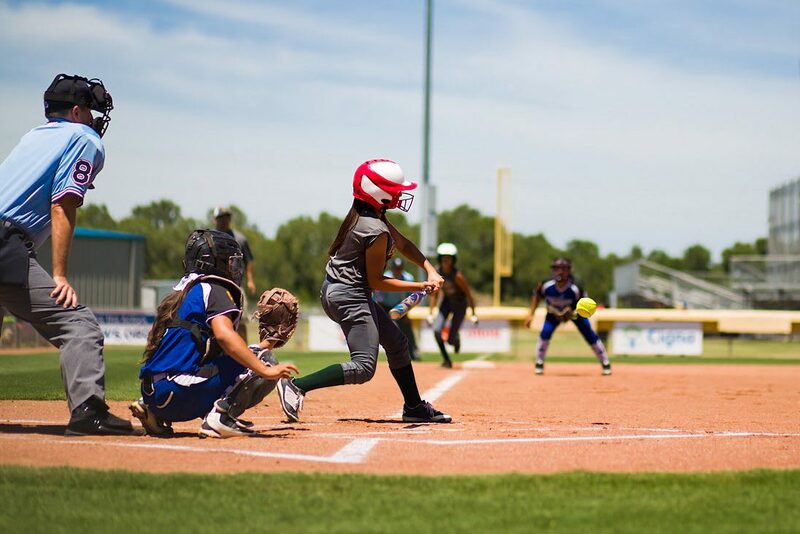 There have been several new and adjusted rules and regulations put in place beginning with the 2018 Little League® International Tournament. To help you officiate games this summer, Tom Rawlings, Little League’s Director of Umpire Development, has provided answers to some of the more common situations and scenarios that will involve understanding these latest interpretations. Mark from California – What should umpires be looking for when verifying the new USABat performance standard bats before a tournament game? Little League – No matter what division of play you’re officiating, it’s vital that you know which bats are permitted for use. For baseball, this means seeing how the new USABat Standard applies to your level of play. For example, Either USABat Standard bats or BBCOR bats must be used at the Intermediate (50/70) Baseball and Junior League Baseball Divisions. At the Senior League Baseball Division, all bats must be meet the BBCOR standard. At the Little League level and below, all bats must be USABat compliant. When reviewing bats, make sure they’re appropriately certified for play with either a USABat or BBCOR mark on the bat. Also, make sure that no bats are damaged, warped, or decertified. In early May, Little League and other youth baseball organizations, were informed that the Easton Ghost X YBB18GX10 30/20 2 5/8″ (or the “Easton Ghost X 30/20 5/8” at retail) – previously approved by USA baseball no longer meets the USA Baseball Bat Standard adopted by Little League Baseball®, and has been decertified. Any additional updates can be found on the Decertified Bat page on LittleLeague.org/BatInfo. Any bats that aren’t approved for game use should be given to the tournament director to return to the team after the game, to ensure that those bats don’t get mistakenly used in the game. Jeremy from Connecticut – There is a new rule about “stealing signs,” how does that work during tournament games? Little League – Per Tournament Rule 3, if in the judgement of the umpire a player/coach/manager/substitute is deemed to be stealing or relaying a pitch, it is considered unsportsmanlike, and said offender is to be ejected from the game. Each umpire has the authority to disqualify any player, coach, manager, or substitute for objecting to judgement call, or for unsportsmanlike conduct, or language. If an umpire disqualifies a player while a play is in progress, the disqualification shall not take effect until no further action is possible in that play. The stealing and relaying of signs to alert the batter of pitch selection and/or location is unsportsmanlike behavior. If, in the judgment of the umpire, this behavior is occurring, those responsible including any player(s), coach(es), and/or manager shall be ejected from the game. Also, the Little League International Tournament Committee in Williamsport, has expanded it disciplinary powers to include imposing specific penalties if, in its judgment, any player, manager, coach, umpire, or other volunteer conducts him/herself in any manner, on or off the field, that does not positively reflect the high standard Little League holds for sportsmanship, citizenship, and decorum. This includes displays of unsportsmanlike conduct, “making a travesty of the game,” or violating any rules, regulations, or policies contained herein during the game, at the game site, at any other location or time related to the International Tournament. The Committee also reserves the right to impose any penalty the it deems appropriate if determining action is necessary to correct a situation brought to its attention, regardless of the source of that information. The decision of the Tournament Committee is final and binding. Gene from Virginia – Before each game, part of the routine is to check batting helmets for the NOCSAE symbol, non-manufacturer stickers, and the general condition of each player’s helmet. This year, I’ve been seeing more helmets with cheek protectors. Do those helmets still meet regulation 1.16? Little League – Per regulation, any modification of a batting helmet makes it illegal unless stated otherwise in writing by the helmet manufacturer. This means that if the helmet was not packaged with the faceguard, and that an individual has had to modify the helmet to attach the cheek protector, that the helmet manufacture may void that altered helmet’s NOCSAE certification. To use a cheek protector during a Little League game, there must be manufacturer approval that the NOCSAE certification is still valid with the alteration. More information, including manufacturer letters, can be found at LittleLeague.org/HelmetAdditions. Becky from Illinois – I understand that umpires are now, in part, responsible for making sure tournament managers are notified during the game about potential mandatory play violations. Please explain when the plate umpire is required to act, and if violation of rule equals and automatic ejection? Little League – According to Tournament Rule 9, Little League® Mandatory Play requires any player below Senior Division to participate in every game,. This rule cannot be waived for any reason, unless the game is shortened. Beginning with the 2018 Tournament A manager’s failure/refusal to insert players into the line-up as outlined in the new rule shall result in immediate ejection of the manager and removal for the remainder of the International Tournament, without replacement. The umpire-in-chief or other individual designated by the Tournament Director in consultation with the official scorekeeper, shall advise both team managers, at the appropriate time as outlined in the new rule, of their obligation to insert all players who have not completed their mandatory play requirement. Should there be additional issues, the Tournament Director should follow the appropriate Chain of Command. Brett from Washington – The local leagues I umpired in during the regular season adopted a 15-run rule along with the 10-run rule. Which is going to be used during the tournament and in what divisions? Little League – The 15-run rule was a local league option during the regular season, but during tournament games, it will be mandatory. Tournament Rule 12 states that If, at the end of three (3) innings [Intermediate (50-70) Division/Junior/Senior League: four innings], two and one-half innings [Intermediate (50-70) Division/Junior/Senior League: three and one-half innings] if the home team is ahead, one team has a lead of fifteen (15) runs or more, the manager of the team with the least runs shall concede the victory to the opponent. If, at the end of a regulation game, one team has a lead of ten (10) runs or more, the manager of the team with the least runs shall concede the victory to the opponent. NOTE: If the visiting team has a lead of fifteen (15) or ten (10) or more runs respectively, the home team must bat in its half of the inning. Mike from Florida – Following the 2018 International Congress, are there any changes to pitching regulations for tournament? Little League – Yes, there are adjustments to the tournament pitching rules, but they are more for the management of the game. Tournament Rule 4 has been revised to state that no player can pitch on three consecutive days and must adhere to the Little League Pitch Count governing days of rest based on the number of pitches thrown. Tournament Rule 11 addresses suspended games, stating any game in which a winner cannot be determined in accordance with the playing rules shall be resumed from the exact point at which it was suspended regardless of the number of innings played. A game called before the end of the first inning will no longer be disregarded or started over. Tournament Rule 7 also impacts pitchers, as it reduces the number of visits a manager may make to twice in one inning or three times in a game for the Major Division and above for Baseball and Softball. If you have additional tournament-specific rules and regulations questions, please email: trawlings@LittleLeague.org.